The amazing Fae of The Fallen Gown, only available from Moonmaiden Gothic Clothing! 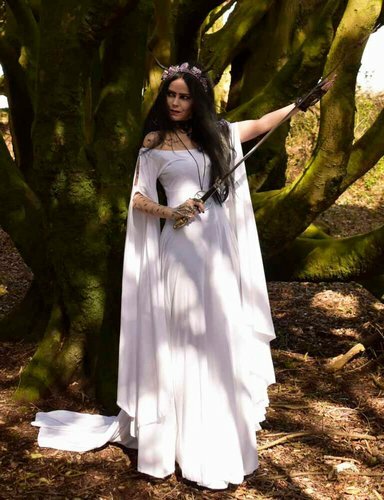 Made from soft cotton jersey, it has an epic, shrouded hood with a wide, not-quite-off-shoulder neckline; the dress is fitted under the bust, with a glorious skirt that is fitted over the waist, then flares out in all it's elven splendour ending in a train. The epic sleeves are slit at the top of the arm, and fall from there to the floor!